Is your style the balding look? If so, then you will need the best electric shaver for bald heads that’s available today. Luckily, there are several models that are top quality. They range from inexpensive to fully-loaded – it all depends on what you needs are. Look below for a comprehensive review. Out of the bald head shaving options this is my favorite. It’s easy to hold in your hand making it easy to shave. 10500 rpms or a close shave! Easy hand held grip. Easy to shave back of head. Click here to read my review…. If you are looking to shave your head, you can choose from a variety of electric shavers, or try a razor specifically made for your head. There are two basic genres of electric shavers: foil and rotary.Foil shavers, like the Panasonic ES-LV81-K Arc 5 and the Braun 7 790cc, have a metallic foil that draws the hair inside toward the cutting blades. This is better for preventing irritation. 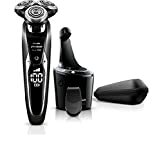 Rotary shavers, such as the Philips Norelco 4500 or the Norelco PT730, have blades on the surface that cut in a circular motion following the contour of your head as it shaves your hair. Then you have the hand held skull shaver like the bald eagle smart shaver that was build for men wanting a head shaver. It has a a nice stand, traveling case and is honestly our top pick. You can find more information toward the bottom of the page on it. You move the head in a circular pattern, and it provides a closer shave overall. 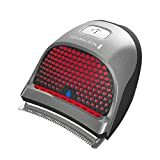 If you think electric shavers can’t beat the perfect smoothness of a simple razor and blade, you might get the best result from the HeadBlade S4 Eclipse or their Headblade Sport model that use a typical razor blade to shave your head. Our focus in this article is going to be on electric shavers. 40 minutes of cordless shaving time. It does come with a travel pouch. Easy to shave the back of your head. This is really a sweet razor to shave your head with. The blade is really wide so it makes short work and hits a large area of your head when shaving. There are 9 different hair length guards that you can use. So, you could also use this for any hair length other than just bald guys. This would work great for any hair length. The price is as cheap as you will find for a hand held electric shaver. You definitely want to take a look at this one if you want that bald shadow look or you are a DIY guy who cuts his own hair. This is seriously easy to hold and easy to get the back of your head with. Find out the best price on amazon here. Let’s start with the top of the line. The has it all for a foil style shaver. This wet-dry shaver offers the ultimate in shaving and convenience features. It starts with five stainless and hypoallergenic Nanotech blades, which move at 14,000 cycles per minute for a quick and accurate shave. The large, multi-flex head with Arc foil pivots 25 degrees up-and-down and 20 degrees side-to-side to move readily about the contours of your head. The Lift-Tech foil ensures that you can cut hairs of different lengths smoothly. Click Here for A Detailed Review Of The Panasonic ES-LV81-K Arc 5. Comparable in quality to the Panasonic is the Braun Series 7 790cc. The specific benefit to this shaver is in its flexibility. If you want to go a few days after shaving your head, the 790cc is the one for you. ActiveLift and OptiFoil technology lift and cut longer hair that lies flat. When added to the Triple Action Cutting System and Intelligent Pulsonic Technology, which provides 10,000 micro-vibrations per minute to lift hair, you have a device that is ideal for cutting hair with a few days’ growth. Braun has also added three modes–Extra Sensitive, Normal, and Sensitive–to allow you to customize your shave based on the surface area and your preferences. Read our Braun Series 7 790cc Review Here. Now, let’s look at some rotary-blade shavers. The Philips Norelco 4100 is a middle-of-the-road model that should take good care of your head. Super Lift & Cut technology lifts shorter hair and cuts it under the skin. The Dual Precision shaving system incorporated in this razor saves you the trouble of trimming the longer hairs to the same length before shaving. The Philips Norelco 8900 has 3 rotary blades like the 810, 880 models but it moves in 8 directions that picks up 20 percent more hair! It offers V-track Precision blade shaving system, which cuts longer hairs and stubble 30% closer in one sweep. In addition, Philips’ patented Super Lift & Cut technology, which causes shorter hair to be lifted and cut under the skin, for a clean shave that lasts longer. And you’ll be glad to have the flexing heads in 8 directions, which follow the contours of your head without irritating. You have the option to dry shave, wet shave and also use gel with it which is awesome! It’s not the middle tier shaver that is a step above the 800 models but still stays at a great price bringing in great features. Last but not least, among the best electric shavers for bald heads is a shaver designed for head-grooming. The Philips Norelco QC5580 works awesome at every stage in the process. If you have just made the decision to go bald, the combs will follow the contours of your head to get a great shave without irritation or scratching. Also, once you are done, you will have an easy time maintaining your style. The QC5580 has 14 length settings from 0-19/32 of an inch so you can decide if you want a little stubble or growth, or none at all. The head rotates 180 degrees so that you can adjust to go in any direction that’s comfortable. The 9700 is one of Phillips advanced electric shavers they have made to date. 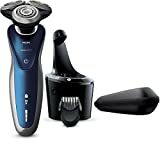 What’s so unique about this shaver is that the heads go in 8 different directions allowing the razor to follow the contour of your head, face, jaw line and neck. This alone helps to cut 20% more and the new v-track design of the blades helps to cut an overall 30% closer. This is a wet and dry razor that has 3 different speed settings so you can adjust it to your skin and hair type. This gets so close that you customers mentioned that if they left it in one spot and pressed too hard for too long it would leave a razor burn like a regular manual razor! You also get a cleaning system with this as well. You can click here to see more about it on amazon for the best price. There is a new kid on the block that allows you to hold the shaver in the palm of your hand and shave your head. The Skull and face shaver is simple to use and uses the same motion as if you were rubbing lotion on your head. With over 1000 reviews you can definitely trust this guy! The Bald Eagle Shaver makes it easy for guys to shave their head with large swirling blades. It has 5 blades that make it easy to cover a large area quickly while following the contour of your head with it flexible heads. You will get roughly 90 minutes of shaving time and only takes a couple hours to charge. What’s really makes it different is the hand held handle that you can shave your head easier than a vertical handle like on the 730 or 830 norelco for example. It’s easy to clean under the faucet when you are done. You will see it discounted on amazon here. It uses the rotary blade style of shaving for a nice close shave. It is different from the 730 and 810 rotary shavers because it actually has 5 heads versus 3 heads. It is cordless and can hold a charge up 90 minutes and takes up to 2 1/2 hours to fully charge it. This has been a popular choice by many visitors on my site which you can read our review on it here. I’d recommend looking at the Norelco AT810 Rotary Shaver for the cheapest rotary head shaver that does a great job for bald heads. For about twice the money you can get the skull shaver which is handier and easier to use. Now if you really want the closest shave possible then there is no electric shaver that will get closer than a razor. In that case go with the elite head blade razor. So, there you have it, I have armed you with a lot of information here. It’s now up to you to make the right choice as to which razor is the right one for you. You click any of the links above to read more detailed reviews of each or hop on over to amazon and get your top choice now so it’s in the mail to your house tonight. I actually recommend using the skull shaver here. If you have used any of these head shavers, can you please comment below no your experience so other men can benefit from your experience so we can all pick out the best one. Thanks a ton! 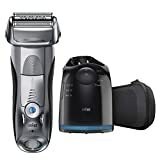 If you didn’t find what you were looking for you can look at my best electric shaver guide here for more options.